Mountains with 6 peaks reaching heights over 12,000 feet. 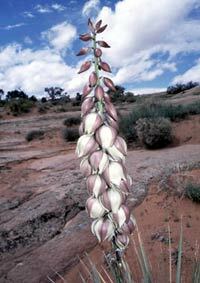 that grows in the area. 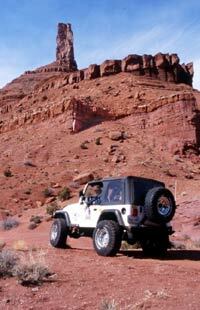 Castle Valley offers some wonderful sight-seeing SUV side trips during your tour of the La Sal Mountains. The La Sal Mountains Scenic Loop can be driven most all year except for the heaviest snow periods. Mountain road trips are often daunting adventures, but the La Sal Mountains, in eastern Utah, can be explored in an easy daylong ride along the La Sal Mountain Scenic Loop out of Moab - and all you need is an SUV. Del Albright says fall is the season to do it, when the brush fields glow red alongside the stands of gold quaking aspens. Fall in central Utah is about as pretty as it gets. With red rock canyon walls looming high overhead and the Colorado River cutting a swath through the landscape, muddy and wide, the region offers magical road trips no matter where you travel. 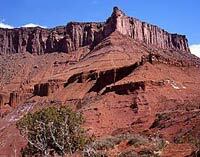 But a special place, full of wonderful sights, smells and sounds, is the La Sal Mountains just east of the recreational Mecca known as Moab, near the Colorado border. The second-highest mountain range in Utah, the La Sals have a dozen peaks that soar over 12,000 feet; the highest is Mount Peale, which reaches 12,721 feet at its summit. Meaning "Salt Mountains" in Spanish, the La Sals were named by the missionary explorers of the Dominguez-Escalante expedition in 1776, in reference to the unusual salty springs around their base. More impressive to me is the sheer beauty of the area, which is now part of the Manti-La Sal National Forest. I've rambled through these mountains many times, during several seasons, and the aspen groves and mountain lakes always take my breath away. The La Sals form a compact mountain range, just 15 miles long and about six miles wide, and there are plenty of ways to explore them. You can hike high country trails, ride a mountain bike, saddle up a horse or, if you come in winter, you can do some cross-country skiing or snowmobiling. But one of the best ways to become acquainted with these mountains is to take a road trip by SUV along the La Sal Mountain Scenic Loop. Start your adventure in Moab with a morning breakfast, then ride the curves east along state Highway 128, the windy river road, to Castle Valley Road, which is about 18 miles out of Moab. The La Sal Loop is not as well marked as it is advertised in brochures, and the name changes along the route, but some road signs do point the way. The Forest Service calls the loop road FR (Forest Road) 062; keep your eye out for those signs and you won't get lost. Turning south onto Castle Valley Road, you immediately enter a surreal kingdom of red castles and tall pinnacles of sandstone, the signature geological formations of this part of the Colorado Plateau. Once you start to climb the La Sals, the geology changes and you will notice different colored rocks. The mountains are composed of granite rocks and quartzes, remnants of an upwelling of magma some 25 million years ago. The first time I started my ascent up the La Sals out of Castle Valley, I marveled at how quickly the brush fields turned to tree stands and then to granite peaks, all the while gawking at the red monoliths, buttes and spires in my rearview mirror. The transition from low- to high-elevation ecosystems occurs quickly and makes for some marvelous picture taking. As you make your way along the loop, you will encounter brush fields, grasslands, groves of quaking aspen, stands of ponderosa pine, and long, cool stretches of spruce and fir forests. Be sure to take a lunch basket as you'll find no end to wonderful pull-outs and side trails for a pleasant stop -- or maybe one of those wonderful, high mountain meadow naps. One of my favorite side trips is down FR 065, the dirt road leading to Miner's Basin. You'll intersect this side road at the 7,800-foot elevation range and it's well marked. There are some mining relics, including several abandoned cabins, and a small lake at the end of this road. The La Sal Mountain Scenic Loop will take you over the top (nearly) of the La Sals, then back down to the high desert where you'll come out about six miles south of Moab on Highway 191. It makes a wonderful day trip that can be done any time of year except in the heaviest snow conditions. Personally, I love this road trip best in the fall, when the brush fields turn red and the aspens burn gold on the hillsides. I like to perch myself on a rock outcropping near the edge of a high meadow to watch the evening light transform the aspen leaves to a new hue of gold. If you do this, bring along your camera and binoculars. This time of year, turkey and deer are out feeding fat for winter, giving visitors an occasional glimpse of nature at its best. Unless you hit snow or get too far off the beaten path, you probably won't need your four-wheel drive. But don't be afraid to grab a little dirt road here and there to see where it might lead you. For safety sake, travel with another vehicle if you can.